Our salmon eggs are now very active alevins. Notice their large egg sacs attached to their undersides that provide nutrients until they can feed on their own in the wild. It will be fun to see their development after Thanksgiving break! It’s an even-numbered year, which means we raise salmon this time around. A big shout out goes to Mr. Segundo for helping get our incubators and chillers out of storage for us and fetching 90 gallons of water from the well. We picked up our salmon eggs yesterday from the ODFW office in Clackamas, and they are resting comfortably in each of our three classroom incubators. It was a little sad to seem them go, and they were a real good group of fish, but it was time to move on with their lives. Yesterday we released our 1,000 chinook salmon fry that we raised in our classrooms since October 23rd. The we]ather was great, for December, and certainly better than the below freezing temps we had last week. The water temperature was 37 degrees so it was chillier than the 52 degree water our chinook fry were used to, but they seemed to adjust fine. Below is a short video of our release day beginning with our students scooping them out of the incubator. Our next planned hatch will be rainbow trout in the winter of 2015! 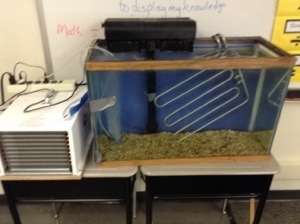 These lonely incubators will be housing some chinook salmon eggs next week for an upcoming STEM unit. This will be the first time since 1993 when we began the program that we have raised salmon. 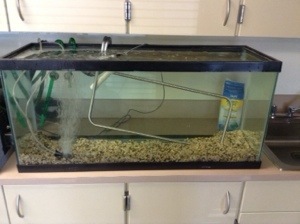 Previously we have raised rainbow trout. We’re looking forward to this new experience!